Saudi-based Aarico (Ashcroft Al Rushaid Instrument Company), the maker of sophisticated pressure and temperature instruments, has witnessed a steady increase in its orders over the past few years with the bulk of sales coming not only from Saudi Arabia but also from Bahrain and Kuwait. Established in 1983, Aarico supplies Ashcroft brand of instruments to various industries including oil and gas, petrochemicals, water treatment facilities, biotech and pharmaceutical labs, semiconductor facilities, refineries, power generation plants, chemical and food processing factories and pulp and paper mills, among other facilities. “Year over year, the performance of Aarico gets better and better through dynamic involvement, implementation and execution of highest level production plan,” said Aarico general manager D R Pai. According to him, Aarico has supplied more than 30,000 instruments to major projects at Jazan and Fadhili in Saudi Arabia, through EPC contractors Saipem and Petrofac during the financial year 2017-2018. These were in addition to its regular supplies to Saudi Aramco and other companies in Saudi Arabia, Pai added. 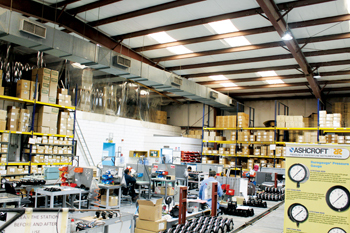 A joint venture manufacturing company between the US-based Ashcroft Nagano Holdings and Saudi Arabia’s Al Rushaid Petroleum Investment Company, Aarico operates a factory in Jubail Industrial City, Eastern Province, and has a strong presence in Saudi Arabia as well as in Bahrain and Kuwait where it markets its products through agents. In Bahrain, Aarico has a long-term contractual agreement with its agent Techno-line Trading & Services WLL, which has a well-equipped office with adequate stock of Ashcroft products. “Bahrain has huge potential for Ashcroft brand of instruments,” said Cherian KM, general manager of Techno-line Trading & Services, and added that they are working towards scaling new heights in business growth in the region. Aarico also supports neighbouring Kuwait through its newly appointed distributor Warba National to cater to the needs of Kuwait market. “Aarico is all set to surge ahead in 2019 with its commitment to cater assiduously and efficiently to the needs of their esteemed customers based in Saudi Arabia, Bahrain and Kuwait,” Pai asserted. Ashcroft pressure and temperature instruments have been manufactured in Saudi Arabia since 1983 and supplied through Darvico. But in 2006, with the realignment of the Ashcroft business worldwide, the company became part of Nagano Keiki of Japan, renowned as one of the world’s largest manufacturers of pressure and temperature gauges, sensors and transmitters, among other things. Aarico is the only company which represents both Ashcroft and Nagano Keiki products in Saudi Arabia, but while the Saudi firm assembles Ashcroft products it only distributes Nagano Keiki products, Pai said. Aarico’s production facility in Jubail is spread across 12,000 sq ft and is fully air conditioned, equipped with modern manufacturing and assembly and test stands, filling stations, dial printing system, large storage capacity, standard room having perfect traceability criteria for master gauges for conducting accurate calibration of instruments. The Aarico plant is certified for ISO 9001:2015 and its products are certified according to Saudi Arabia Standards Organisation (SASO) standards. Pai further added that Aarico’s strict conformance to Ashcroft manufacturing and quality assurance procedures ensures that all products made by Aarico at its Jubail facility in the kingdom have the same field performance as those in Ashcroft plants in the US and worldwide. The facility has trained and certified manpower to perform assembly work, testing and calibration conforming to national and international standards. According to Aarico’s executive director Meshary Al Oqaily industrial training is being implemented thoroughly at Aarico in compliance with Saudi Arabia’s national policy for creating job opportunities for Saudi nationals. “Saudi nationals including women are being employed and trained in large-scale at Aarico and they are now doing various jobs including assembly work, calibration of gauges, handling quality services and sales and order processing jobs,” Al Oqaily said. One of the main highlights at Aarico is its stocking programme for fast-moving items with the integrated software (AIMS) and long-term agreements with major oil and petrochemical companies Saudi Aramco and Sabic. The programme ensures fast execution of Aarico’s orders for its popular products such as model 1279 DuraGauge, which was introduced recently. “The stock of all parts including bourdon tubes of different ranges is readily available for such popular products with the help of this programme,” Pai said. The new improved model ‘Dura gauge Plus introduced recently in the Gulf market does not require liquid filling, but it has engineered dampening agent which dynamically dampens the pointer and movement due to which getting accurate reading is possible where vibrations are high without adding the fill fluid, he explained. “The new product line is cost effective as no liquid is required; safer from any leakages; and is easy for recalibrating and taking reading, wider ambient temperature range and eliminates disposal and environment issues, as well,”said Pai.